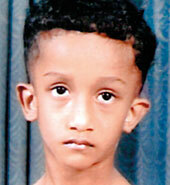 Mohamed Salmankhan (seven-years-old) has a boil in his abdomen and has to undergo surgery which will cost Rs. 250,000. The family is in need of financial contributions as they are unable to meet the cost of surgery. They kindly request that donations be sent to M.N. Alimudeen Commercial Bank Account No: 8560025151, Wattala Branch or M.N. Alimudeen Sampath Bank Account No: 100954087269, Nawam Mawatha Branch. No. 30, Muthuraja Mawatha, Mabola, Wattala. TP: 0777513154.